If you have plans for a Fourth of July party and you live on the eastern coast of the United States, prepare to have those plans disrupted by an unplanned guest named Arthur. Namely, Hurricane Arthur (not your Uncle Arthur, he’s still in Boca). The first tropical storm of the season has matured into the first hurricane of the season, and he’s going to disrupt a lot of holiday plans. 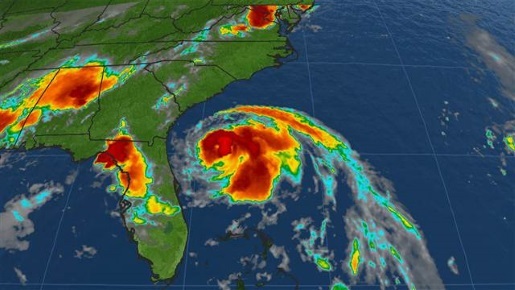 Hurricane Arthur is expected to make landfall in North Carolina and drag its way up the east coast, bringing heavy rains along with him. Hope you’re ready to have a good Third or Fifth of July party instead. Indeed, the tourist areas in North Carolina, particularly the tiny Outer Banks islands, are already evacuating tourists off the islands. Meanwhile, Boston’s famous Boston Pops concert and fireworks has been pushed forward to July 3, and lots of other great plans are getting moved around, changed, or otherwise shifted to avoid Arthur’s meddling. However, being only a Category 1 hurricane, he’s not expected to bring too much pain.